How Many Jars Do I Need? Have you decided to make the switch from mason jars to Pickl-It’s and are trying to figure out what to buy and how many? At first I thought I would need lots and lots of jars because of all the fermenting I do but guess what? I don’t. Even with water kefir, milk kefir and at least one ferment running at all times, I’m finding I don’t need huge arsenal of Pickl-It jars. For the fervent fermenter like myself, I can easily get by with 3-5 jars. For the casual fermenter, 1-3 would be fine. How do I do it? Well, I only need Pickl-It jars for the actual fermentation period. After that it can be packed into another jar for storage in the fridge. I do recommend you use a jar that locks down like the Fido jar since mason jars are not air tight (did you see my pic of oxidized carrots?). Here is what my ferment shelf looks like… a 1.5L jar for my milk kefir, a 1L jar for my water kefir, a 1.5L for Spicy Dilly Beans, 1.5L for Garlicky Cauliflower and a 3/4L for my beet kvass. This is usually the most I will have going at one time. I normally have between 1-3 veggies ferment and I always have milk and water kefir going. Once these ferments are ready to go in the fridge, I’ll swap the top out for a regular Fido lid and into the fridge they go. The Pickl-It lid then goes on a new jar to start a new ferment. What size to get? A liter is just over a quart in size but the jars are shorter and wider than a mason jar. So while I normally used quart sized mason jars before, I like the size of the 1.5L the best for veggie ferments. Green beans fit standing upright perfectly and a medium to large sized head of cabbage with a bit of onion or carrot fits nicely in one as well. I like having a variety of different sizes so I can pick a jar based on how much I’m putting up. 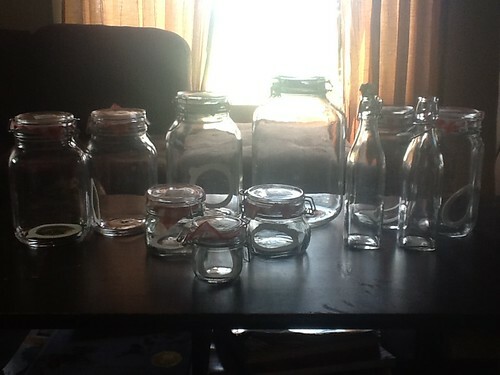 In addition to my Pickl-It jars, I have started collecting Fido jars too. Pickl-It’s are made from Fido jars so using them together is perfect. Pickl-It’s are for fermenting and Fidos are for storing. That helps keep things more affordable as well. Sur La Table carries Fido for $3-9 a jar and while this is still more expensive that regular old mason jars, they are so much better (and prettier). These Fido jars are excellent for storing ferments since they create a much better seal than a mason jar. Fido jars are certified hermetically sealed, meaning no oxygen will get in to damage my wonderful ferments. In a jar like this, fermented food will last for a long time. So while a mason jar is still much cheaper than a Fido jar, I’ll be throwing out less mushy oxidized ferments and will be able to enjoy them longer. This is what came in the mail for me today from Sur la Table and is just part of my new Fido jar collection. 14 comments to How Many Jars Do I Need? Thanks for this. I’ve been searching for a source for Fido jars. Crate & Barrel carry them as well for around the same price range as the link you mentioned. This is a great post. I just bought some Pickl-It jars but have been feeling overwhelmed about the storage issue. If you have to store everything in Pickl-It jars in the fridge, you’d need a lot of jars! I’m going to try out the Fido jars. It sounds like you store your finished water kefir and milk kefir (not just veggies) in the Fido jars, too, right? Thanks, that’s all good to know. I guess I will have to experiment with everything to see what works best! Hi, I have a question. Thanks by the way for your info on Pickl-It. I just ordered some of their jars. This will be my first attempt at fermenting veggies so I am a little nervous. I previously order some starter culture..Body Ecology. I am wondering..for two 1 liter jars..approximately how much starter will I need to use ? From what I have read, it sounds like I don’t need all of a packet for that amount but never having done this before, I need some guidelines. Hoping you can help ! I’m sorry, I actually haven’t used Body Ecology so I’m not sure. I’ve used Caldwell’s starter but it’s pretty rare that I use it at all. I’m finding using just salt with the Pickl-it is all that’s needed. Thanks for all your work on this great site, Melanie. I’ve been attempting to assimilate all the info re Pickl-it vs other methods. You refer to transferring contents out of Pickl-it jars after the first fermenting period, as I’ve read elsewhere. Doesn’t this defeat the purpose of the anaerobic system? Once it’s in new jars, how does the oxygen then escape? Thanks for your help. That was my first thought about transferring ferments and that would be a problem if you were to transfer to a mason jar. I keep all of my ferments in Fido jars, which is the jar Pickl-its are made out of and are airtight. The tops are interchangeable so the only thing I need to do is swap the top out. As I eat the ferment, once there is 50% or less in the jar, I’ll move the ferment to a smaller jar. Even in the fridge, the ferments usually stay a little active for a while and continue to produce CO2. Of course when you open the jar to eat out of it, oxygen gets in but it’s better than a mason jar that has a continual slow leakage. But what’s the point of making a ferment if you can’t open the jar to eat it? Lol! I do know from experience that there is a huge difference between my ferments stored in Fidos and ferments stored in mason jars. They last amazingly longer and have no visible oxidation if kept in a Fido. I do all my ferments in a Fido. No Pickl-it or air locks needed. The Fido’s gasket acts like an air lock, it allows some CO2 to escape while keeping the oxygen out. No mold, no problems. Its cheaper too. Hi! I’m still new to fermenting. Thank you for all your information about fermenting foods! I have a question about the lid swapping for pickl it and fido jars. Do the size of the lids differ? For example, could I use a pickl it lid from a size 3 liter jar with a size 1 liter fido jar (and vise versa)? Or do the fido and pickl it jars have to be the same size to be able to swap the lids? Also, is it hard to swap the lids? All the lids are interchangeable except the tiny .2L size (which is a little harder to find anyway). So a 1L lid will fit on a 3L jar perfectly. It’s very easy to swap the lids out. The wire bail is easy to disassemble and reassemble. I want to 12 week ferment before starting to use because as of right now I react to even the slightest amount of juice from the foods. Once they hit a week do I leave in the pickle-it to go in the basement for the continued weeks OR do I transfer to a Fido and let it continue that way? OR do they not go into the Fido until going into the fridge?